I'm always on the lookout for new websites and new things to do on the web. It's kinda hard sometimes to discover a new website simply because it stays unhidden. But thanks to websites like www.AyosDito.ph, the catchy site's name makes it interesting to learn exactly why it is "ayos dito". 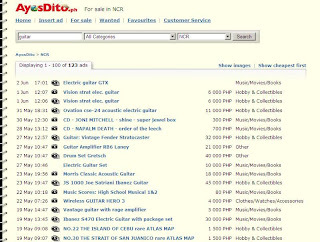 AyosDito.ph is the newest Pinoy buy and sell website. Post anything you need to sell and while you're there, check out anything you might see worth buying. The searching process makes it easier since their ads are categorized by region. So there's no need to go through the painstaking process of finding a car you like and wanna buy only to find out that the car and it's owner is in Zamboanga. Being a musical enthusiast, I immediately checked for some musical instruments up for sale and found a long range of electric guitars of different brands and models including a lot of guitar accessories. Looking for something not available in stores or in the market anymore ? Hunting down that collector's item CD you always wanted but couldn't find it for its rarity ? Or simply looking for a great deal you can avail on. Check out www.AyosDito.ph. They have new items every day.